Sunrise of Frederick was expensive, and the rooms were small. The staff was OK. The dining area was small, and the rooms had a microwave and a small refrigerator. Sunrise of Frederick was the nicest place I visited. It's fairly modern and had all the comforts of home. The dining room was very nice, with a Coke machine and an old-fashioned popcorn machine. They had a little dog on site that was walking around saying hi to everybody. The place was up to date. The person who gave me the tour was fantastic and was a pleasure to deal with. We were very pleased with Sunrise and found it clean and the staff warm and welcoming. This facility is smaller than most we toured and my mother really liked that it seemed manageable and not overwhelming. The residents here seem happy and were accepting of my mother. She enjoyed the food, activities, and her room, but more importantly the staff who treated her just like family. This personal care and concern gave us a great peace of mind and comfort with Sunrise. I would highly recommend touring if you are looking for long-term care for your loved one. Sunrise of Frederick was just OK but nice. The staff was pleasant. I didn’t look into it that much because they don’t have long-term care, and everybody seemed kind of lethargic. The rooms seemed OK.
Sunrise of Frederick was fine. It was a very nice and clean place. The tour was fine, but we were just with one individual the whole time. They were very thorough, helpful, and answered all of our questions. The dining area was nice and very restaurant-like. Sunrise of Frederick’s location was very convenient. We are very familiar with Frederick since my daughter was there. It’s very neat and clean. The staff was friendly and very accommodating. We liked the floor plans, and the price was fairly reasonable. The best way to get to know a community is by scheduling a tour. See the facilities, meet the staff and residents, and get a feel first hand what it's like to live at Sunrise of Frederick Assisted Living. Situated in the bustling city of Frederick only an hour's drive from both Baltimore and Washington DC, Sunrise of Frederick offers Maryland seniors a warm and welcoming place to call home. Our community is just a short distance from the town's major retail centers, hospital and within walking distance of several lush parks enabling residents to easily enjoy all the city has to offer. Sunrise of Frederick is a part of Sunrise Senior Living, one of the world's most experienced providers of senior living services. Our services are delivered by staff trained to encourage independence, preserve dignity and enable freedom of choice. 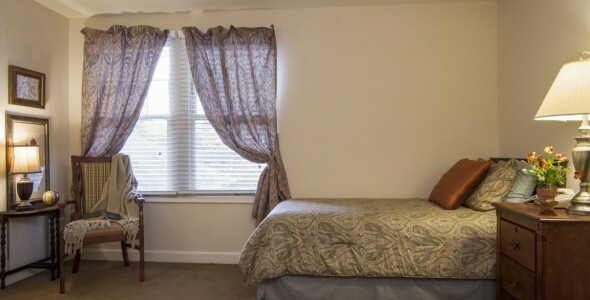 Our elegant community is decorated with luxury furnishings and offers deluxe accommodations. Private apartments feature plush carpeting, large windows, natural lighting and private bathrooms equipped with walk-in showers. Residents can be found relaxing in our comfy rocking chairs on our wrap-around covered porch, listening to music from our full-size jukebox or perfecting their game during a round of Wii bowling in our media room. We understand that eating well is a critical component of maintaining good health, which is why we offer our residents three nutritious meals a day as well as a selection of snacks to keep them as healthy and well-nourished as possible. Our chefs always use fresh, often local ingredients to prepare delicious meals from scratch each day. To ensure the comfort of our residents, our professional staff provide weekly housekeeping, personal laundry and trash removal services to each private residence. Personal caregivers are available on site, 24 hours a day to offer assistance with basic activities of daily living such as bathing, eating and mobility, all within the privacy of a resident's apartment. While moving into a new home can seem like a tough challenge, it is made much easier when there are amazing homes like Sunrise at Frederick available.